Xavier Musketeers forward Jalen Reynolds (1) reacts his team closing the gap on a 12-point lead by the Alabama Crimson Tide during the second half at Coleman Coliseum. Xavier won 77-74. 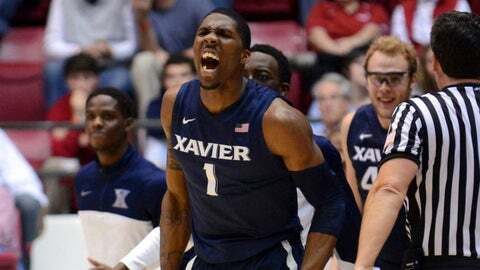 TUSCALOOSA, Ala. (AP) — Isaiah Philmore had 17 points and 12 rebounds to lead Xavier to a come-from-behind 77-74 victory over Alabama on Saturday night. Matt Stainbrook added 17 points, Dee Davis 12 and Myles Davis 10 for the Musketeers (9-3). Retin Obasohan nailed a 3-pointer to pull the Crimson Tide to within 75-74 with 4 seconds remaining, but Dee Davis made two free throws with 2 seconds left. Trevor Releford led Alabama (5-6) with 17 points. Shannon Hale, coming off the bench, had 14 points, and Levi Randolph had 13. Trailing 44-32 at the 16:25 mark, Xavier fought back to tie the game at 61 on a field goal and free throw by Stainbrook with 5 minutes left and then take the lead 63-61 on a layup by Dee Davis with 4:40 to go. The Musketeers maintained the lead the rest of the way to win their fourth straight game.